Farsi Level 2 continues where Farsi Level 1 leaves off. It expands your options giving you increased confidence and fluency that will allow you to join in conversations, and to communicate ideas with greater accuracy and detail. Upon completion of Level 2, you'll be speaking at an Intermediate mid level on the ACTFL scale, and with pitch-perfect pronunciation. Reading Lessons are included to expand vocabulary and to provide an alternative view of the sounds and sound combinations. When they've finished, learners will be able to read the language at the same level as they can speak it. Persian is the official language of Iran, Afghanistan, and Tajikistan. It belongs to the Indo-Iranian group of languages and is spoken worldwide by approximately seventy-five million people. Persian has three major dialects: Farsi (spoken in Iran), Dari (spoken in Afghanistan), and Tajik (spoken in Tajikistan). Dari and Tajik are considered a purer form of Persian – that is, they show less Arab influence – but all three dialects are more or less mutually intelligible. 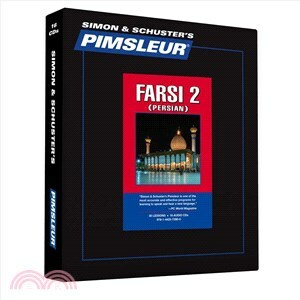 This course teaches Farsi-Persian. CDs are formatted for playing in all CD players, including car players, and users can copy files for use in iTunes or Windows Media Player. Dr. Pimsleur was one of the world’s foremost experts in applied linguistics. He taught French phonetics and phonemics at UCLA after obtaining his Ph.D. in French and a master’s degree in psychological statistics from Columbia University. Pimsleur went on to faculty positions at Ohio State and SUNY at Albany, where he held dual professorships in Education and French. His research focused on language acquisition, especially the organic learning that takes place as children learn to speak their native language. He discovered how to organize the materials of the second language to fit the one way that the stream of speech of an unknown language can enter the consciousness of the adult and be processed through the language learning power of the human brain. He applied the results of his research on the acquisition process to second-language learning and the results became the Pimsleur Language Learning Method.